AMERSPAN is a trading and construction company importing light, multi-purpose, steel structures of self-supporting arched halls of the modular system from the U.S.A.
Their original surface finish treatment Galvalume guarantees the life-time of these constructions for the period more than 50 years under all the weather conditions. Steel with this aluminium-zinc-silicon surface is a very tough and resistant material which by its philosophy bucks the consumer spirit of our time. 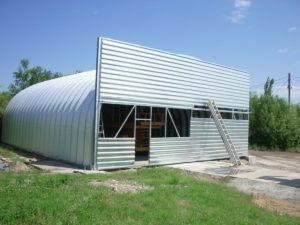 Since 2009 more than 100 of these multifunctional steel halls have been delivered to the Czech, Slovak, Polish, and Slovenian markets to the extensive clientele including the warehouses, various agricultural premises, hangars or garages, production and sales premises for various uses. By its activity our company has gradually earned the exclusive representation for selling these halls in the Czech Republic and Slovakia, and at the same time the authorization to develop the business activity almost in all the countries of the Central and Eastern European countries except for Austria. 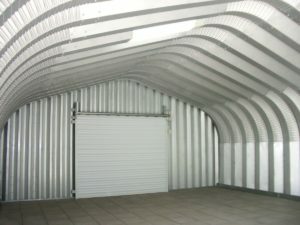 The multifunctional steel halls having the name AMERSPAN (an abbreviation of the American steel trade and production corporation AMERICAN STEEL SPAN) are manufactured and supplied as the sets by a customer´s request in 4 basic shape modifications S, P, Q and A ranging from the basic width of 3 m in the S model to the width of 24 m in the Q model. 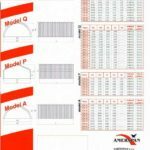 The range of widths at the single models varies with regard to their static bearing capacity. In case of the P and S model series with straight walls and different shapes of roof sections the maximum width is 9 and 16 m, in case of the A and Q models it is 12 and 24 m.
Steps in widths in all the types are by 1 to 1.5 m from the narrowest to the widest model therefore it is almost always possible to accommodate the client´s demands without problems. The length of premises is not limited. The halls are made of steel sheet Galvalume which is delivered in the thicknesses ranging from 0.8 to 1.5 mm so that they would comply with the required snow and wind loads in the given locality. The AMERSPAN halls are homologated for the European market and meet all the European standards for such type of constructions which is proved in each model series by an EU accredited testing laboratory. Complete technical documentation is provided with each hall in the scope from the beginning to the implementation of a construction. The main advantage of these halls is their overall lifetime and resistance connected with the full maintenance-free use. The other advantages are their modular flexibility, demountability and subsequent capability of transport connected with undemanding storage, trouble-free reparability and a possibility of retrofit. By means of foundation connectors the AMERSPAN halls may be fastened to concrete or asphalt hard surfaces, to metal and wooden structures, to higher external walls, to separate strip foundations or also only to temporarily laid concrete panels. These halls can also be easily insulated by the internal insulating technology DAPE which is a PET foil with an alu-foil with mineral wool sealed in it. AMERSPAN provides the corrosion protection guarantee for these halls for the period of 25 years.